Use Well Safe Well Sanitizer Kits to sanitize your well twice a year or after any regular system maintenance such as repairing or replacing your pump. Using a combination of chlorine pellets and granular chlorine slurry, these kits kill bacteria, prolong pump life, and reduce iron bacteria build-up. You can use these kits down the well, in storage tanks or throughout your plumbing system. 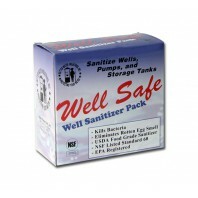 Discount Filter Store carries the C21000 Well-Safe Well Sanitizer Pack at a competitive discount price. If you have any questions, comments or concerns, please contact us or call 1-800-277-3458.